More than 50 women attended the 2018 WiF Reception. The Chemical Coaters Association International (CCAI) has announced the dates for its first Women in Finishing Forum which will be held in Notre Dame, Indiana, USA, from 9-11 May 2019. This follows a networking reception which took place at Fabtech 2017 and the establishment of the Women in Finishing (WiF) group. The Forum will feature a variety of professional and personal development sessions and workshops geared toward women, as well as networking and team building activities. Topics to be covered include effectively navigating conflict, building a championship mindset, the impact of wellness on success, successful finishing career journeys from women in the finishing industry, and more. 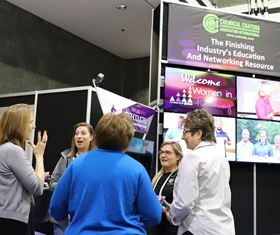 ‘We are thrilled with the response to our WiF reception at Fabtech the past two years and are excited to grow WiF programming to further meet the needs of women in industrial finishing,’ said CCAI’s VP of strategic initiatives, Sheila LaMothe. This story uses material from the CCAI, with editorial changes made by Materials Today. The views expressed in this article do not necessarily represent those of Elsevier.